The following two South Carolina Rural Infrastructure Authority projects received funding in May 2014. These applications were prepared by Catawba Regional Council of Governments and were funded under the Basic Infrastructure Program. Project Description: The project will consist of the construction of approximately 2,370 linear feet of eight-inch PVC water lines, the installation of 5 fire hydrants and appurtenances to serve the area of Main Street between Caston Street and Bridges Street. Beneficiaries: 631 residential units and 196 commercial units. Project Description: The project will consist of the construction of approximately 2,600 linear feet of a twelve-inch PVC water line from the elevated water storage tank at Washington Street to North Congress Street. 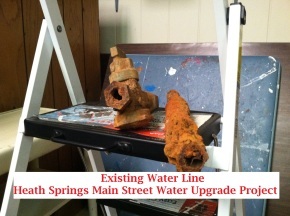 Connections to existing 6-inch water lines on Lowry Row, Magnolia Street, Herndon Avenue, Harbor Street, Smith Street and Wright Avenue will also be made to the new 12-inch water main. There will also be 6 fire hydrants installed and the section on West Madison Street will be resurfaced.